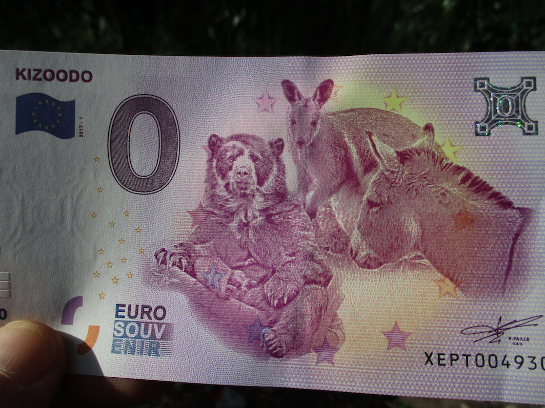 The Euro Souvenir banknote is very successful in marketing a Zoo, an Animal Park, Wildlife Park or Animal Sanctuary in France, Germany and other EUR countries. It is a very popular souvenir for visitors and also the large community of collectors waiting for new motifs to be released across the EU. There are already many customers that provided their desired motif for their own banknote, and started to raise awareness for their respective organisation. Below are a few examples of customer motifs in Germany. For a better overview of all the beautiful motifs produced in other countries, please find here the motifs of Germany and France. You will see that the following are only a glimpse of the variety and popularity of the Euro Souvenir (0 Euro) Banknotes. The zoo of the city of Münster has produced a beautiful design of a lion and a leopard and the result was a high quality print and an exceptional souvenir banknote for their own zoo. They market the product on-site as well as online via their webshop. The sales of the 0 Euro Banknote have in fact been so successful for the Alletterzoo in Münster, that it has already produced 3 different designs. Please see the other motifs further below. Kizoodo is a non-profit organisation in Germany that raises funds for children and for the local zoo in Dortmund, by doing fundraisers and collecting donations and other activities. 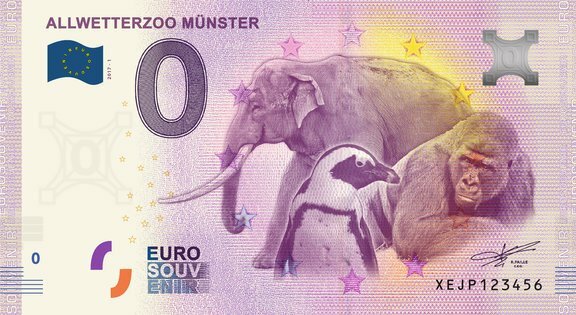 The zoo is currently raising funds for a new animal compound, and uses their Euro Souvenir banknotes as a successful tool by selling it online. "For our current project, the reconstruction of the spectacled bear compound in Dortmund Zoo, we need your help. In order to provide the spectacled bear Moritz with a new home, we have to collect a total of 400,000 Euros. We have already collected a part of the sum so that we can start erecting the construction fences this year and symbolically start the conversion." 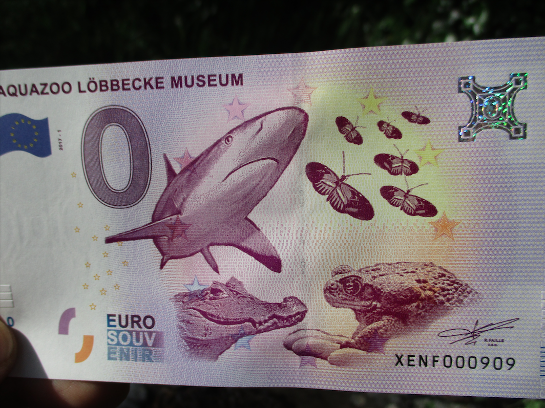 The Aquazoo Löbbecke museum dedicated a 0 Euro banknote to the own organisation and officially launched it when the Aquazoo was re-opened on 22. September two years ago. They sold it exclusively in the shop of the entrance area of the Aquazoo for 3 EUR per banknote. The motif is an excellent representation of the variety that visitors of the Aquazoo get to see, and is a very popular keepsake for visitors and a great way of generating complimentary revenue and a marketing communications tool for the Aquazoo. 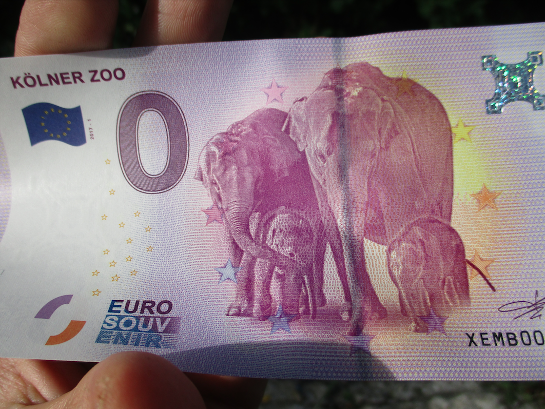 The Zoo of Cologne provided a great picture of a family of elephants for their own, personalized 0 Euro banknote that they market to the visitors of the zoo. 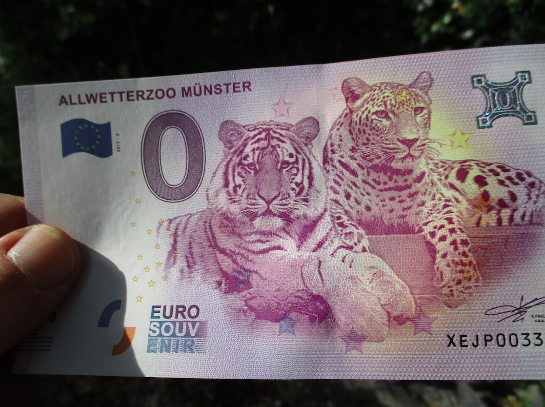 This is the second 0 Euro Banknote of the Münster Zoo. 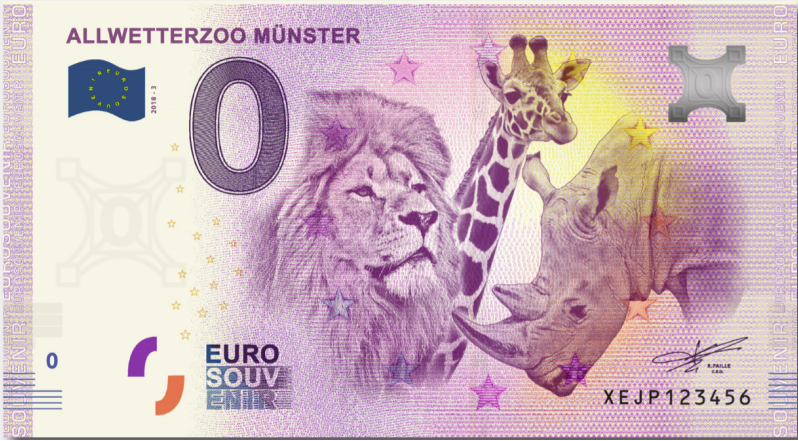 This is the third 0 Euro Banknote of the Münster Zoo.